Live performance from The Foundling series (2014). Terry Smith, The Foundling. Venice International Performance Art Week (2014). Photograph by Monika Sobczak. Born 1956. Living and working in London, artist Terry Smith is best known for his carvings into the plaster of walls, mainly in derelict buildings and spaces. His performances are collaborations with artists from various backgrounds. In 2008, Smith was a recipient of the Paul Hamlyn Foundation Award for Artists. At the VENICE INTERNATIONAL PERFORMANCE ART WEEK 2014, Smith continues working on his on-going multi-disciplinary project The Foundling. Initially commissioned by Gill Hedley for the Foundling Museum’s contemporary art program, The Foundling is constructed in a series of individual and related sequences that have been developed through a series of live performances that have taken place over the last years. Using found images and sounds as well as deconstructed scores by Handel and Vivaldi, The Foundling plays with ideas of the hidden and the lost. In a year, which celebrates Baroque music this piece acknowledged the active contributions that Handel and Vivaldi both made to institutions in London and Venice respectively, dedicated to giving vulnerable and destitute children a second chance at life. The special live version performed at the VENICE INTERNATIONAL PERFORMANCE ART WEEK includes commissioned texts by Mel Gooding. Recorded music deconstructed score with Oliver Oates and Ian Dearden. Live Music Performance with: Marita Isobel Solberg (Voice), Giorgio de Battisti (Violin), Mauro Sambo (Sax), Samanta Cinquini, Micaela Leonardi (Performer). Coordinated by Jennifer Macmillan Johnson for Studio Contemporaneo. 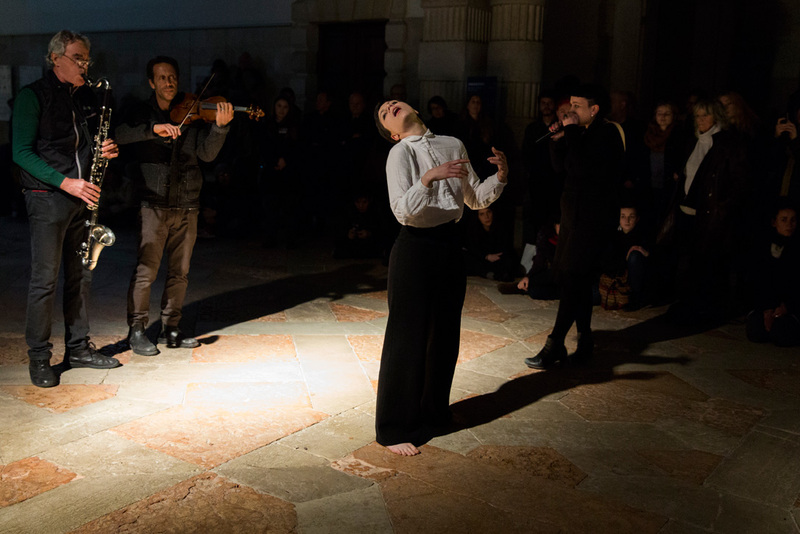 This is a Special Event of the VENICE INTERNATIONAL PERFORMANCE ART WEEK in collaboration with the Fondazione Musei Civici di Venezia at Ca' Pesaro Museo Internazionale d'Arte Moderna. Kindly supported by TROMS FYLKESKOMMUNE | ROMSSA FYLKKASUOHKAN.